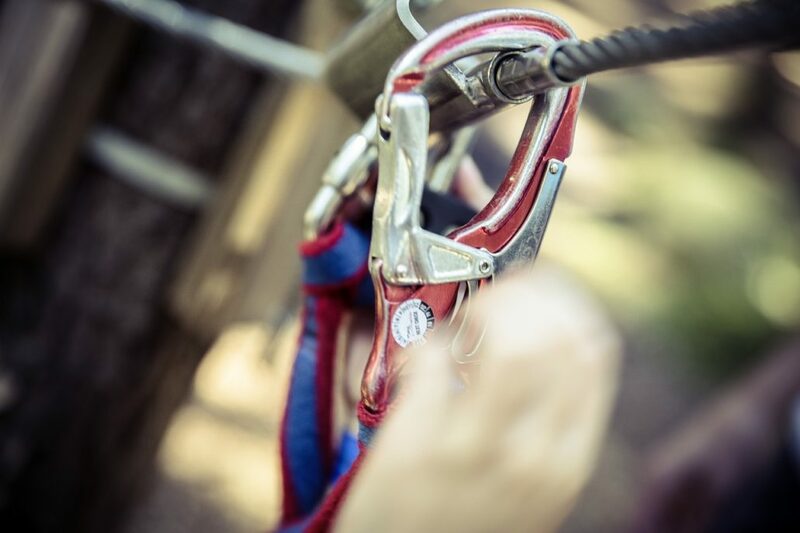 A few weeks ago I went on an awesome treetop adventure course, climbing, tightrope walking, and zip-lining more than sixty feet off the ground. To make it all the way through the course without falling required a combination of balance, strength and creativity. Fortunately for anyone who thought they lacked sufficient balance, strength, or creativity, we all wore a harness tethered to a safety cable that kept us from falling more than a few feet towards our untimely demise. I had a great time, moving from obstacle to obstacle without giving one thought to my wellbeing. After completing the first section, one of the instructors asked me to come to the front of the line. I didn’t understand why and felt bad for “cutting in line”, but the enthusiastically sweet instructor welcomed me on to the second half of the course with a huge smile and said “Go have fun!” To my amazement the entire second half of the course was empty – wide open and waiting for me. The instructor had noticed my comfort on the first half of the course and how much time I spent waiting for others to cautiously cross the obstacles. He set me free on the second half and seemed to enjoy watching me fly through almost as much as I enjoyed doing it, playing like a carefree kid. What struck me as interesting to think about was how different this experience might have been if I had attempted it without a harness. Even though in the end I never fell or made use of any of the safety equipment, I suspect much of my attention probably would have been focused on not falling to my death and I most likely would have had a lot less fun. Imagine yourself strolling down a narrow sidewalk without a care in the world. Now, imagine walking down that same narrow sidewalk 1,000 feet in the air. Notice the difference? Then just last week in Athens, Greece I had almost the opposite experience. While on a walk in a park I came across a beautiful towering tree that begged to be climbed. Its branches were broad and perfectly spaced all the way up to the top. Before I had time to think, the tree climbing kid inside of me was up amongst the branches. Like a monkey, I began easily climbing up. But the higher I got, the more worried thinking I had. In reality, the tree was just as simple to climb 35 feet up in the air as it was when I was only a few feet off the ground, but I began to think more and more about the “what ifs.” Just as I suspected when I was on the adventure course, without the safety equipment I began to worry more about falling than enjoying the experience. Remember, when I did the adventure course I had the safety equipment, but never needed it. On the tree, I didn’t have any equipment. So while I had full confidence on the lower branches, I experienced significant unease on the higher ones. It wasn’t the tree that caused me to experience the uneasiness; it was my imagination running wild. I was overthinking. The higher I got in the tree the heavier my thinking got, and as you can probably imagine that feeling wasn’t helpful at all. To me the equivalent of “trusting the equipment” in life is an unconquerable faith in the future. What if we knew the universe always had our back? Imagine having a celestial carabiner attached to the cable of life and no matter what happened you’d be safe. Sure, life throws us obstacles and challenges involving balance, strength and creativity. That’s just life. When we have an unconquerable faith in the future we can zip along through the course of life really enjoying the ride. April 11th is the beginning of a fun and deep exploration of Coddiwompling. What might be possible if you totally unscripted your life? It’s been Fourteen months since I started an experiment to see what might happen if I lived purely by instinct and feeling. What happened surpassed my wildest dreams, but to my surprise, this simple, natural way of living has also impacted people all over the world. Everywhere I go people have wondered if they can possibly live this way right where they are without having to get rid of everything they already love in their own lives. The answer is an emphatic YES. Come join in. The Coddiwomple Now group coaching program begins March 21st and includes ten weeks of exploring the simplicity and freedom of living a life of limitless possibilities.